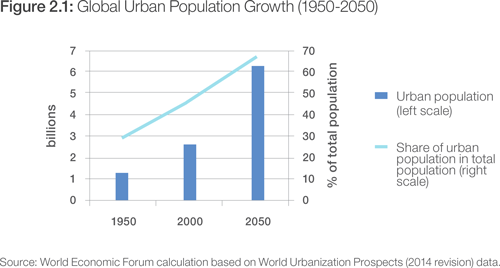 If managed well, urbanization can bring important benefits for development. Cities are an efficient way of organizing people’s lives: they enable economies of scale and network effects, and reduce the need for transportation, thereby making economic activity more environmentally friendly. The proximity and diversity of people can spark innovation and create employment as exchanging ideas breeds new ideas. The diversity of cities can also inculcate social tolerance and provide opportunities for civic engagement. Already today, the linkages between cities form the backbone of global trade, and cities overall generate a large majority of the world’s GDP. Rapid urbanization can alter the nature of almost every global risk considered in this report by influencing its likelihood and impact. In addition, cities are points of convergence of many risks, which make them particularly vulnerable to chain reactions and amplify the interconnection between global risks. Better knowledge of how such risks interconnect in their materialization at the city level is the first step towards helping cities build resilience. Three regions – South Asia, East Asia and the Pacific, and Latin America and the Caribbean – have identified this risk as among those for which they are the least prepared (Figure 1.7 and for more details see: www.weforum.org/risks).11 The following sections consider four selected and particularly daunting urban challenges: infrastructure, health, climate change and social instability. The quality of a city’s infrastructure – its housing, electricity, roads, airports, public transport, drinking water, sanitation, waste management, flood defences, telecommunications, hospitals, schools and so forth – largely determines its residents’ quality of life, social inclusion and economic opportunities. It also largely determines the city’s resilience to a number of global risks, in particular environmental, social and health-related risks, but also economic risks, such as unemployment. Indeed, the availability and quality of infrastructure are at the core of many of the challenges faced by rapidly urbanizing cities in developing countries, which are developed further in this section of the report. As cities in developing countries are expanding rapidly, it is likely that infrastructure will not be able to keep pace with their growth nor the increased expectations of their populations. Action to close the infrastructure gap is urgently needed and will strongly influence the potential of risks to have catastrophic cascading effects. To provide adequate global infrastructure for electricity, road and rail transport, the OECD estimates that telecommunications and water will cost approximately $71 trillion by 2030 – an enormous challenge as it represents about 3.5% of forecasted global GDP.12 Most of this investment will be needed in emerging economies. For instance, the Programme for Infrastructure Development in Africa estimates that Africa will need to invest up to $93 billion annually until 2020 for both capital investment and maintenance; currently only $45 billion is financed, which leaves an infrastructure gap of $48 billion per year to be financed.13 In addition to the provision of infrastructure, it is critical to consider its location as risks can emerge if developed in the wrong location relative to the needs of the population. Where will the money come from? Most governments are under tight budget constraints and many developing countries already spend a large proportion of their national income to meet the basic needs of their population.14 Consequently, cities are looking for public-private collaboration to involve the private sector in the design, construction and maintenance of infrastructure. However, to promote successful public-private collaboration, corruption must be tackled, as it is a traditional problem in construction projects and dissuades investors. In addition, the key enablers of public-private collaboration at the city level include factors such as transparency (in such matters as partner selection and contract execution) and the availability of accurate data to allow risk assessments. Public-private collaboration is a way for cities to identify where cooperation can address problems that neither municipalities nor the private sector can solve alone (for example in advanced telecommunications infrastructure) and both will have a major role to play. Much discussion revolves around the potential for technology to increase the efficiency with which urban infrastructure can be managed. The use of big data, the Internet of Things and ubiquitous smartphones promise to revolutionize aspects of city management, from keeping traffic flowing to reducing electricity outages, tackling crime and preparing for emergencies. Developing countries have the opportunity to leapfrog by avoiding the mistakes made by more advanced countries and applying the lessons learned from the development of smart city infrastructure. However, while “smart cities” should work better, they may also be more vulnerable to cyber error or terror (see Box 2.3). When discussing “smart cities” it is important to note the human component. Indeed, if technology developed for smart cities does not embrace universal design to ensure use by all (including the disabled and the elderly), its benefits could be controversial. One excellent case study is the city of Surat in India. Hitting rock bottom due to a public health disaster in 1994, it introduced measures to drastically raise hygienic standards, making it one of the cleanest cities in India today.16 However, when urbanization is rapid and unplanned, a combination of high population density, poverty and lack of infrastructure – especially water and waste management – can create the conditions for communicable diseases to flourish. Almost 700 million urban dwellers currently lack adequate sanitation.17 The problem is particularly acute in Sub-Saharan Africa and south-central Asia, where 62% and 43%, respectively, of the urban population live in slums.18 Such conditions create increased risks of illnesses, worm infections, cholera and diarrhoea – a leading cause of preventable death in children – and help spread emerging infectious diseases, such as Severe Acute Respiratory Syndrome (SARS) and H1N1 influenza.19 With the projected huge increase of populations living in slums and the growing sophistication of transport networks between cities, the spread of infectious diseases could happen extremely quickly and could be difficult to contain, creating the risk of global disease outbreaks. The prevalence of diabetes in emerging economies is rising: in China, it is already comparable to that in the United States: in 2013, the figures were 9% and 9.2%, respectively. In Kuwait, diabetes prevalence has been as high as 23%; even in a low-income country such as Burundi, it reached 4.5%.22 Although a formal link between diabetes and urbanization has not been established, the number of urban dwellers with diabetes in low- and middle-income countries is projected to almost double from 181 million today to 347 million people in 2035.23 In India for example, diabetes prevalence is close to epidemic proportion and is attributed – at least partially – to urbanization.24 This will put huge pressure on already fragile healthcare systems, the collapse of which could have devastating cascading effects with dramatic economic losses. Addressing non-communicable diseases will require efforts to tackle the causes of air pollution, which is estimated to have caused 7 million deaths in 2012.25 Air pollution tends to be more of a problem in developing than developed countries, in part due to coal-fired power plants and the use of biomass for cooking and heating, but mostly due to private transport vehicles.26 Over 90% of air pollution in developing world cities is attributed to old, poorly-maintained vehicles running on low-quality fuel and to roads prone to traffic jams.27 The rapid rise of non-communicable diseases in low-income countries could jeopardize poverty reduction and limit inclusive outcomes from growth. The concentration of people, assets, critical infrastructure and economic activities in cities exacerbates the potential of natural catastrophes to cause unprecedented damage: heatwaves, extreme rainfall and drought-related shortages of water and food will increasingly test the resilience of infrastructure in these and other cities. The effects of shortfalls are likely to be felt mostly by the poor, whose informal settlements tend to be on land at especially high risk from extreme weather.30 Making cities more resilient to extreme weather events should be a priority for both local governments and the private sector. Cities not only need to adapt to climate change, they also have a major role to play in mitigating its impact. While established cities with efficient mass transit systems have relatively low carbon footprints, the early phases of urbanization tend to generate massive greenhouse gas emissions as the construction of infrastructure uses concrete and metals that are carbon-intensive to manufacture.31 Developing countries already account for around two-thirds of annual greenhouse gas emissions, caused in part by their economic growth and rapid urbanization.32 The rapid expansion of their cities means that mitigation measures have to be taken today to help tackle climate change. With adequate land-use planning and in coordination with the private sector, cities can develop infrastructure in more sustainable, low-carbon ways – but this requires governance, technical, financial and institutional capacities that are often lacking in developing countries.33 Leadership within local governments is at the heart of both urban mitigation of and adaptation to climate change.34 Well-governed cities with universal provision of infrastructure and services have a strong base for building resilience to climate change if processes of planning, design and allocation of human capital and material resources are responsive to emerging climate risks. Rapid urbanization and the related growing demand for housing are creating pressure on the housing market and social tensions are expected to increase. The shortage of affordable housing not only contributes to social exclusion, it can also threaten to destabilize the wider economy if the housing price increase fuels property bubbles. Making housing more accessible, affordable and adequate for urban dwellers is therefore of critical importance. A wide portfolio of policies, from limiting excessive credit to optimizing land use and development activity in cities, is crucial to mitigate these risks and equitably distribute the benefits of urban growth. Urbanization creates opportunities but also exacerbates risks, and the speed at which it is happening challenges our capacity to plan and adapt. This is particularly true in developing economies. For rapid urbanization to provide opportunities to all, carefully considered urban planning and good governance with effective regulatory frameworks are required. However, governments of rapidly-growing cities often have little time for adjustment and learning. As a consequence, inadequate planning and ineffective governance can bring significant economic, social and environmental costs, threatening the sustainability of urban development. The inability of governments to provide appropriate infrastructure and public services is at the core of many urban challenges in developing countries, which range from the incapacity to contain infectious disease to the challenges of building climate-resilient cities. At the same time, these challenges have worsened due to the rapid and chaotic development of cities. City leaders from government, civil society and the private sector are ideally positioned to plan rapid urbanization and must act to sustain metropolitan growth. What is more, as the world continues to urbanize, power will increasingly be concentrated in cities. This power – ranging from economic to social not only makes cities the centre of gravity, but offers greater scope to find practical solutions to the most pressing challenges. Indeed, many observers and organizations are now focusing on cities and the connections between them rather than directing their attention at the national level. The strength of city-level institutions in addition to national institutions – their capacity to be flexible, innovative and dynamic, and effectively involve multiple stakeholders in governance – will largely determine whether urbanization makes the world more resilient or more vulnerable in the face of global risks. Box 2.3: Life in the city – how smart is smart? Like industry, cities are increasingly investing in information technology-based systems to address the challenges of managing large enterprises and enabling service innovations. While these investments often deliver rapid improvements in efficiency and operational continuity, they also create unexpected new risks: bugs and brittleness. The growing amount of software used to manage urban infrastructure increases the likelihood of coding errors that can cause catastrophic failures, especially in highly-centralized control systems. For instance, in 2006, San Francisco’s Bay Area Rapid Transit network was laid low for days when initial efforts to fix a bug inadvertently triggered a larger and longer outage. Smart city systems also rely on many underlying technology platforms that are surprisingly brittle. For example, the Global Positioning System (GPS) is not only relied on for navigation services but also serves an irreplaceable time synchronization function. Likewise, thousands of smart city apps and websites rely for their core computational capability on the cloud computing infrastructure of companies such as Amazon, which have experienced several major outages in recent years. The brittleness of mobile cellular networks presents a special challenge to resilience for large cities. Unlike the Internet – which, at least in theory, possesses significant resilience through its multiple, redundant linkages – cellular networks have several choke points. Cell sites themselves can be damaged physically. More importantly, the supporting wired infrastructures for electrical power and “backhaul” connections to the communications grid can fail: both the Japanese tsunami in 2011 and Superstorm Sandy in 2012 caused damage to cellular networks that took weeks to repair. The most dangerous failure mode for cellular networks is due to congestion – during crises, panic dialling frequently overwhelms the carefully-managed wireless spectrum these networks depend on. All levels of government will need to be more assertive in auditing and stress-testing vital digital infrastructures. The sudden and unexpected failure of these systems during crises has crippling knock-on effects across official and civilian response and relief efforts. Even during peacetime, the economic and social effects of bugs and brittleness can be devastating, with potential for long-lasting impacts. Assessments must go beyond cybersecurity, as the risks are not just about external threats but also about the fundamentally unstable dynamics of digital infrastructures and the complex, chaotic and unpredictable ways they can interact with civic, social and economic systems. Dense urban living facilitates the spread of infectious diseases. Particular vulnerabilities exist in countries where rapid urbanization results in informal settlements that make it difficult to control transmission and can therefore increase the risks of mosquito-transmitted epidemics, such as malaria, tuberculosis, dengue and yellow fever. 4 United Nations DESA, 2014. 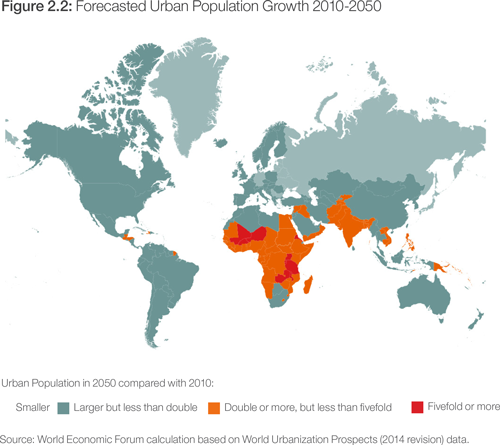 5 Forecasts show that over four-fifths of the world’s urban population will live in less-developed regions by 2050. 6 United Nations DESA, 2014. 7 McKinsey Global Institute, 2011. 9 United Nations Water, 2013. 10 World Economic Forum, 2014. 11 World Economic Forum Global Risks Perception Survey 2014. 13 See “Improved Infrastructure to Support Africa’s Competitiveness” at http://www.afdb.org/en/blogs/afdb-championing-inclusive-growth-across-africa/post/improved-infrastructure-to-support-africas-competitiveness-11755/ and “Strategic Infrastructure in Africa” at http://www3.weforum.org/docs/AF13/WEF_AF13_African_Strategic_Infrastructure.pdf. 14 McKinsey Global Institute, 2013. 15 Alirol et al., 2011. 16 World Economic Forum, 2014. 17 Hawkins et al., 2013. 18 See UN Water, Water for Life Decade at http://www.un.org/waterforlifedecade/water_cities.shtml. 19 Alirol et al., 2011. 20 Alirol et al., 2011. 21 World Health Organization, 2014b. 24 Ramachandran et al., 2008. 26 Seto et al., 2014. See also WHO’s 7 May 2014 news release “Air quality deteriorating in many of the world’s cities”; http://www.who.int/mediacentre/news/releases/2014/air-quality/en/. 27 See UNEP, “Urban Air Pollution”; http://www.unep.org/urban_environment/Issues/urban_air.asp. 28 See WHO Bulletin “The Impact of Climate Change: Migration and Cities in South America”; https://www.wmo.int/pages/publications/bulletin_en/Bulletin632-2014_southamerica.html. 30 Revi et al., 2014. 31 Seto et al., 2014. 32 New Climate Economy, 2014. 33 Seto et al., 2014. 34 Revi et al., 2014. 35 McKinsey Global Institute, 2011. 38 See The Guardian article “Murder capitals of the world: how runaway urban growth fuels violence”; http://www.theguardian.com/global-development/2014/nov/01/murder-capitals-world-city-violence. 2 United Nations DESA, 2014.